Do you simply love the beach? Then you're like many others and it's time to put your passion to work for you with this specialty internet business opportunity at Pure-Ecommerce. Introducing SimplyLoveTheBeach.com! This website offers a memorable domain name and ready-made design online shoppers will love. Here they can shop for a variety of products perfect for those who love the sound of crashing waves and the warmth of soft sand under their feet! 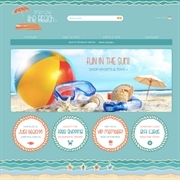 The easy to navigate categories include essentials needed for a day at the beach from furniture to "relax in style", stylish swimwear for the family, sports & toys for "fun in the sun", and "don't forget about Fido" as there's pet gear here too! This fun to run website is 100% responsive design, which means it offers online shoppers a great shopping experience whether they are shopping from a PC, smart-phone or tablet. Plus, they will be captivated by the "beachy" style design and eye-catching images and marketing message to grab their attention! You can connect with your customers and beach lovers through the social media pages connected to the home page. You can share beach-day tips and coastal inspirations to help them enjoy their day at the beach. This ready-made website offers the essentials you need to get started in the online marketplace. Our team will research, contact and gain approval for the initial product vendors, as well as, load the first 100 drop ship products to get you started. Once you become the owner of this website you will be able to select the next 200 products that we will load for you. By working with drop ship vendors you do not have to hold any bulky or expensive inventory, plus you can work from home on your own schedule. You will also receive 40 hours of step-by-step ecommerce consulting and access to our exclusive eLearning Library. During our 10 step process, you will learn to set up, market and manage your new online business. Need additional assistance? Then you should consider our platinum package upgrade, it includes many perks to jump start your online business even more. Are you interested in this beach lovers website? Act now - Take the first step and inquire today to learn how we can help you get started!